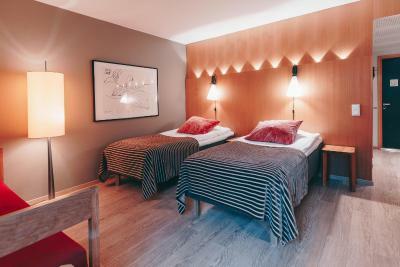 Lock in a great price for Centro Hotel Turku – rated 8.5 by recent guests! Hotel was located in a central location, but on a courtyard away from traffic, so quiet yet near activity. Breakfast was excellent. Good location. Good room. Stayed for 2 nights in a small double room. Room was cosy, new light and fresh and super clean. Ensuite with a good shower, very light and super clean. Bed was excellent, firm but soft on top. 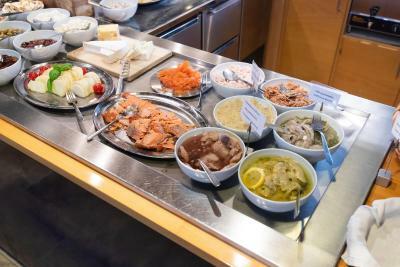 Scandinavian breakfast was incredible, champagne included. Staff were very professional, friendly and helpful. Very central location and the hotel is in a courtyard so very quiet. This hotel is simple, clean, and comfortable. It is located in the city center. Staff is very friendly and helpful. Very clean, comfortable room. Very quiet. Excellent breakfast! Central location. The late night check in was fine. 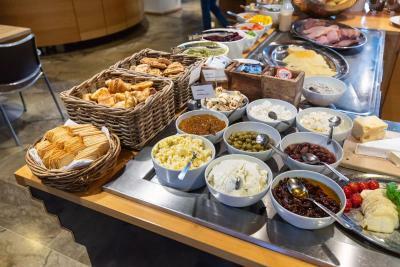 Reception staff in the morning was a bit rude but breakfast was good. Overall good experience. 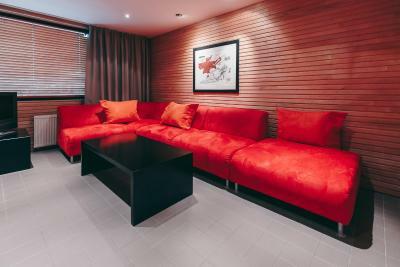 Centro Hotel Turku This rating is a reflection of how the property compares to the industry standard when it comes to price, facilities and services available. It's based on a self-evaluation by the property. Use this rating to help choose your stay! 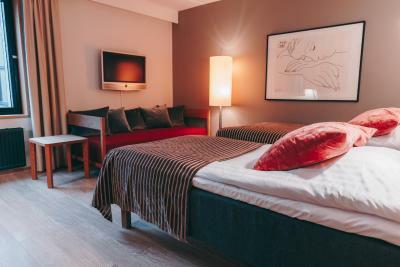 One of our top picks in Turku.Centro Hotel Turku is located in Turku, 3 minutes' walk from the Market Square in a quiet inner courtyard. It offers guests free access to both gym and fitness classes at nearby Motivus Fitness Center. 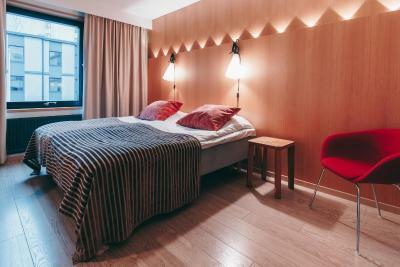 All individually decorated rooms at Turku Centro Hotel feature a flat-screen cable TV, modern art and parquet floors. Free Wi-Fi is included. 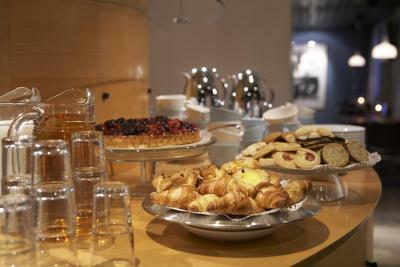 Guests can enjoy a varied breakfast. 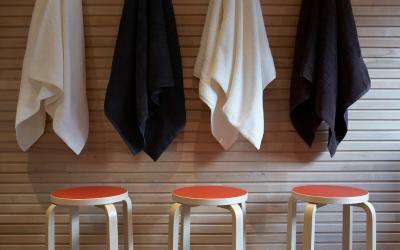 Facilities on site include a lobby bar, bookable sauna and indoor children's ball pool room. The 14th-century Turku Cathedral is a 5-minute walk away. 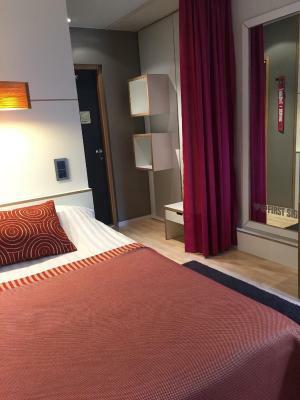 Hansa Shopping Center is 1,650 feet away, while Turku Art Museum is 2,300 feet from the hotel. 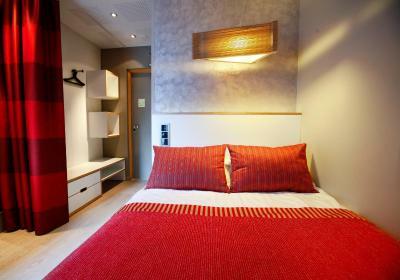 When would you like to stay at Centro Hotel Turku? This room includes hardwood floors, a desk and a flat-screen TV with cable channels. 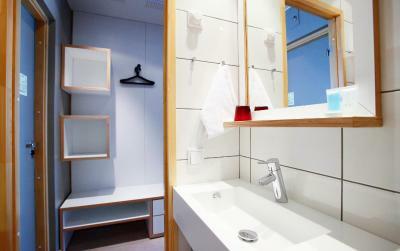 Includes Spa Vital toiletries, a bottle of sparkling mineral water and a flat-screen cable TV. 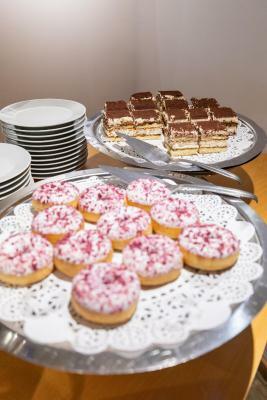 Also included is a light evening snack served from 18:00 until 21:30. This larger room has hardwood floors, a desk and flat-screen cable TV. 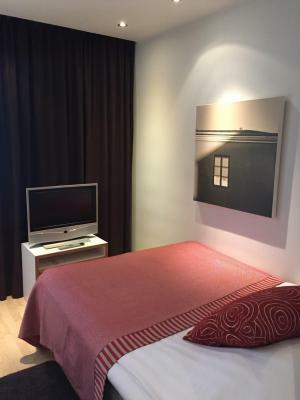 Includes wooden floors, a desk and a flat-screen TV with cable channels. Please note that children staying in this room must be 12 years or younger. 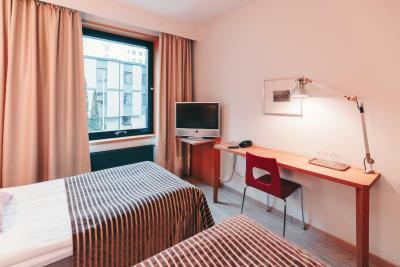 This room includes Spa Vital toiletries, a bottle of sparkling mineral water and a flat-screen cable TV. 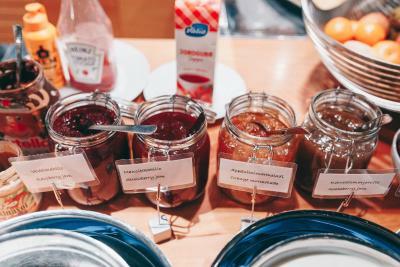 House Rules Centro Hotel Turku takes special requests – add in the next step! Centro Hotel Turku accepts these cards and reserves the right to temporarily hold an amount prior to arrival. Please note that parking spaces are limited. They are issued on a first-come, first-serve basis. The lack of tea. coffee and milk facilities in the room for making an early morning cuppa otherwise absolutely fine. Had to pay €12 per night for parking. The hotel staff were very friendly and helpful. The hotel and rooms were spotlessly clean. Good breakfast and an ideal location. Everything was OK -just keep the quality of your service as it is now ! The (lack of?) view from the window was depressing. No light stores that kept privacy, and many windows from the houses around had full insight to the room. So I had to keep the light-tight curtains closed to change and for privacy. There was only one tiny window. There were a lot of noises from the neighboring rooms that were disturbing. 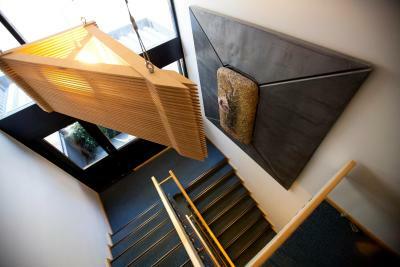 The TV had only Finnish and Russian channels, the same with newspapers in the reception: no international publications. Only Swedish and Finnish magazines. Overall, I found the Hotel a little bit overpriced given that there was a lack of amenities, like a mini-bar, iron etc., and you had to leave the hotel for the fitness center. I would have loved to give the feedback directly to the staff at checkout, but they were not interested and did not even ask how my stay was. The breakfast was really great! Very happy with that, good coffee. 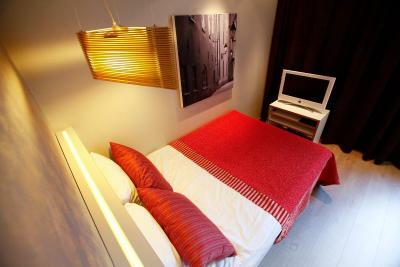 Comfortable bed, cute room that was furnished smartly and very clean. Bathroom was small, but big enough for me. Good water-pressure in the shower. Loud noise from pipes ( i guess) near the head of the bed. I kept weaking up and did not get good sleep. Also there was no drinking water jar anywhere. 0.5 L bottle of water was 3€! 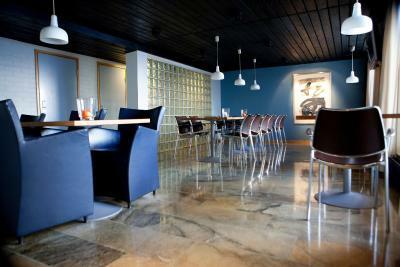 The Centro Hotel is very well situated, as the name suggests. 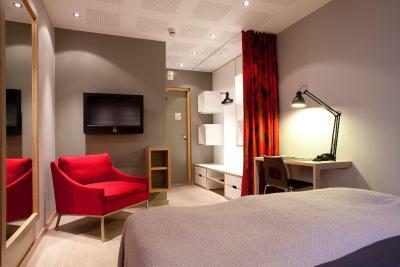 It is within short walking distance of Turku centre, the river front, shops, bars and restaurants etc. 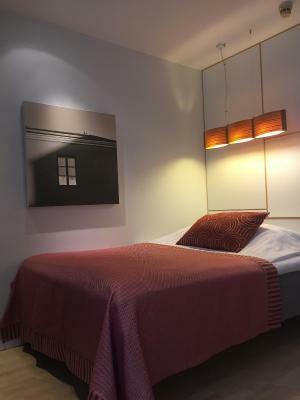 The staff are very friendly and helpful and the room was immaculate, with a very comfortable bed. I was even given a room upgrade on arrival at no extra cost! I had a very pleasant visit overall, despite only staying one night. 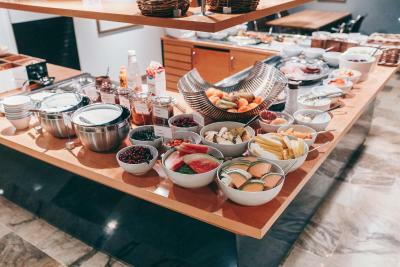 I didn’t get the opportunity to avail of the breakfast bar as I had an early flight but I have stayed at the Centro before and can remember being impressed at the buffet selection. Kiitos! Only cold buffet served on an evening. For hot food a walk out into the cold to find a restaurant was required. Room was warm and comfortable. Nice room and great breakfast! 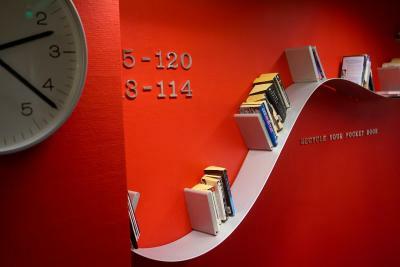 The temperature in the room was perfect and the staff was very helpful. Very good value for money. Clean, nice service, quiet room, great breakfast. My room was next to the staircase, so I was waking up at night many times when somebody was walking down- or up-stairs. My room had had very small window facing towards other building's wall. 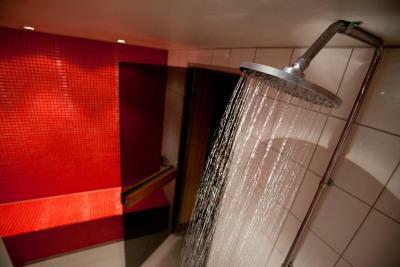 The shower space was very tight with shower curtain being electrostatically attracted to your body. No mini bar nor electric kettle in the room, although you can borrow one from the reception if you ask. 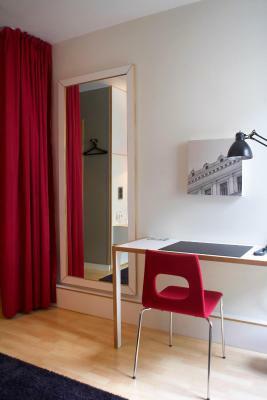 Quality/price ratio could be better - you can get a better standard room for the same price in the center of Helsinki. 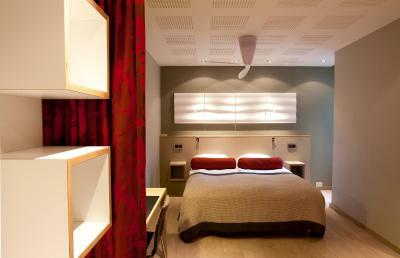 The room was comfortable, with very calming design and the bed was very comfortable and large. There was a writing desk with adjustable lamp, that was very useful for me since I had to do some paperwork.